Well, we're home from camping, and it was actually quite a lot of fun! 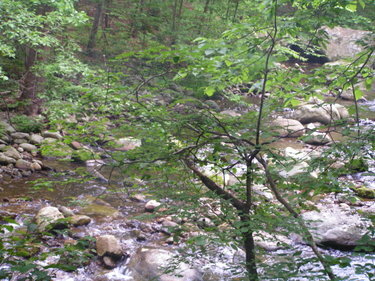 The campsite sat at the foot of a waterfall and the sound of the water lulled us to sleep. It was beautiful. This was the view from our tent. I managed a one mile hike up the path of the waterfall. So I felt like I worked off some of the calories from all the S'mores I ate! Spent lots of time sitting around the fire and talking. Just being. That's something that doesn't happen very often. Mario, of course, loved every minute of the entire weekend! Just loved being outdoors. I've been busy cleaning, upacking, airing out everything we took which now smells of campfire. While I was gone, I did get some goodies in the mail that I thought I'd share with you. My friend Tica sent this parcel of vintage French children's newspapers from 1906. How adorable they are. I love the tag she made and all the little details. The beauty is in the little things, isn't it? And this one is a parcel from Corey. 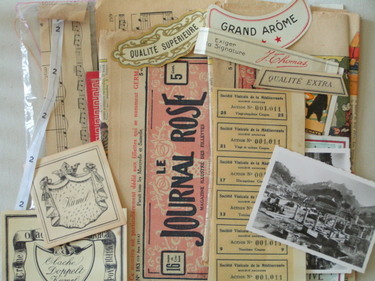 Vintage French papers. Can't get enough of these! I just love the fonts that were used back then. Well, girls, I'm off to continue with the laundry....... more news (and the surprise) later this week! 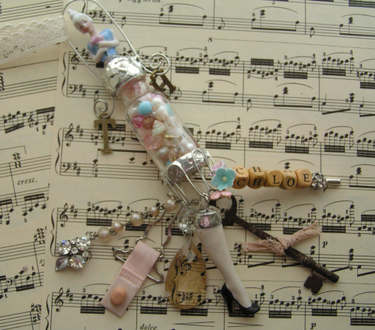 I made this dangly doll for a friend and I love the way it turned out. With soldering, sometimes you never know how it's going to look.....at least that's the way it is with MY soldering. 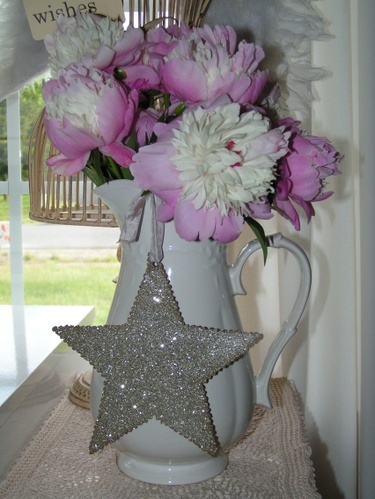 These "vintage vessels" as Sally Jean calls them in her book, Pretty Little Things, are lots of fun to make, and her book gives great instructions. I've got so much to do. There's a big surprise happening soon that I haven't told you about yet. I plan on spilling the beans sometime next week, so stay tuned! 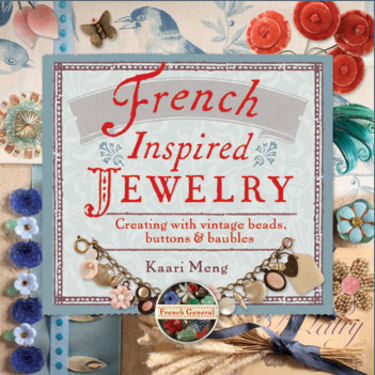 ....that Kaari Meng of French General has a new book coming out this fall? Ooooh, it looks like a good one! 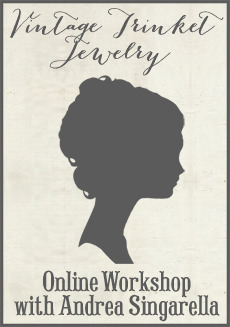 I've already pre-ordered a copy because I know I'll forget about it by fall.....not that I'll be making much jewelry with a new baby! And also, a little fyi for ya. I'm sure almost all of you have read somewhere in Blogland that Victoria magazine is being republished. It will be bi-monthly this time around. The first issue is the Nov/Dec 2007 issue, shipping in October. If you want, you can call this number to subscribe now. (205) 262-2121. Just thought you'd want to know! 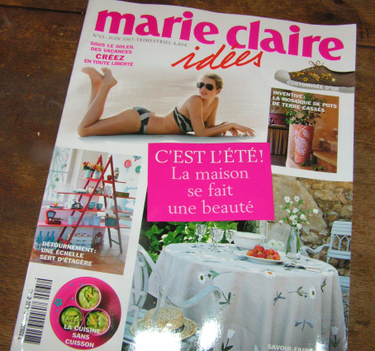 Gotta love Marie Claire Idees. The pictures and ideas are so creative and inspiring. Now if only I could read French. You can purchase a subscription through Amazon, by the way. A gift from my friend Lisa. She made this piece of art for me. Isn't it sweet? A fun surprise to open up! 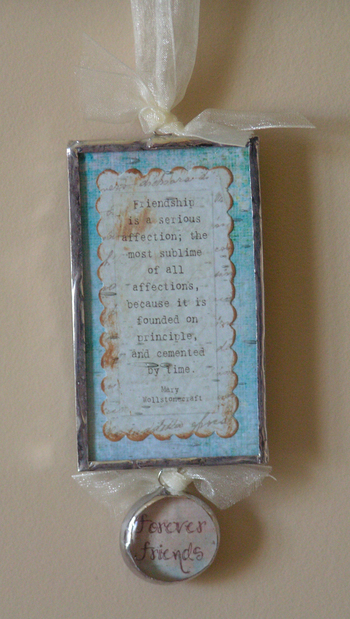 It says, "Friendship is a serious affection; the most sublime of all affections because it is founded on principle, and cemented by time." And then, this arrived in the mail a few days ago. I ordered it from Lauren Mumford's etsy shop. 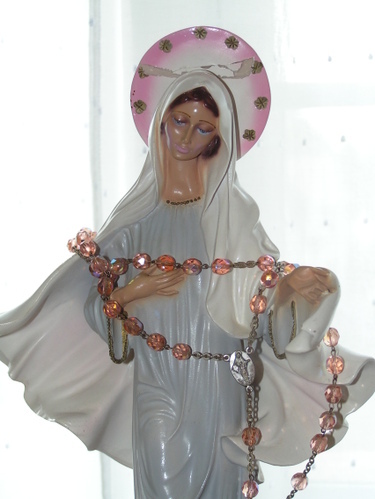 It can be worn as a necklace or belt or it can be hung on a hook or peg or draped around a dressform. 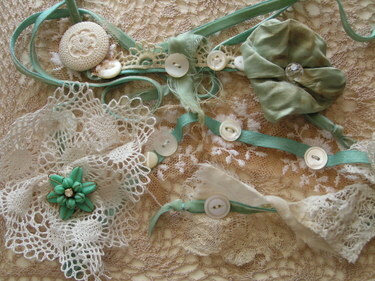 It's a length of old velvet ribbon with here and there "bits" of lace, buttons, jewels. Just wonderful, don't you think? I saw it and had to have it. Oh how I love peonies. They are my absolute, no doubt about it, favorite flower. Even above cabbage roses. I think it's their delicateness that I love, and perhaps the fact that they are so short-lived. I wait all year for their tiny "fingers" to break through the mulch. They just started blooming in my garden, and this is the first cutting. I have 3 peony bushes at the moment. All are starts form my mom's plants. One of them has been passed down for generations and was my great great grandmother's. It should be noted that George thought it was a weed and mowed right over it after I planted it a few years ago. I was pregnant with Mario at the time and an emotional hormonal nightmare anyway. When I walked outside, I saw the plant was gone and stood in the yard crying, "I can't believe you can't tell the difference between and peony plant and a weed! That was my great great grandmother's." I think back and laugh so hard now. Poor George. I wanted to carry peonies in my bridal bouquet, but it was August and they were not in season. 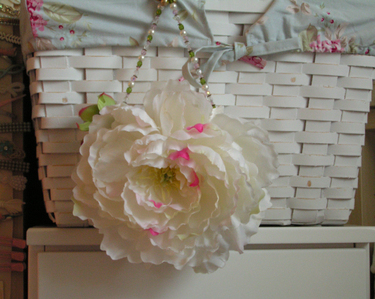 So, I ordered this peony purse to carry at the reception. Each petal is individually hand-stitched onto a dupioni silk bag (which you really don't see). I got it from a company called The Marigot Collection. Sadly, I just checked and their website isn't up any longer. 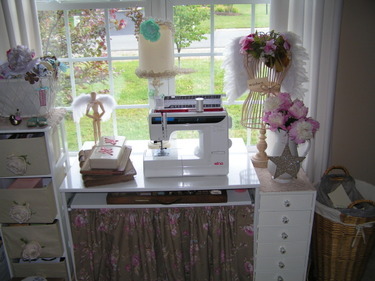 Anyhoo, I'm enjoying these beauties sitting near my sewing table in my little studio. I know that their delicate petals will start falling off anyday now. Brief beauty. But well worth it! Want some peonies? Go here. Request a catalog. Swoon. They are simply gorgeous! George and I have this thing where we claim the whole weekend as a specific holiday. For example, this entire past weekend was "Mother's Day Weekend". And I really milked it! In June, he'll have Father's Day weekend, and his only request will be to relax and do nothing all weekend. My requests are a bit different. I want to go places, do things, get out of the house. So, on Saturday, we headed to Downtown Charlottesville. So charming. A very peculiar place in Virginia. We both felt that it had a modern European feel to it. We enjoyed pizza by the slice and then an authentic gelato at a little parlor down the road. We got Mario a "bambino gelato" as they called it. The cone was only 2 inches tall. It was the cutest thing ever......but I left my camera in the car. Darnit. On the way home, the little one fell asleep in the back seat just in time for me to pop into some great antique malls in Ruckersville. Here are some of the day's finds. 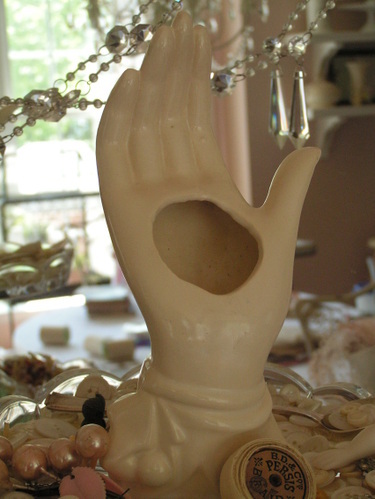 The McCoy hand-shaped planter (above) is in perfect condition. It replaced the (now dead) lily of the valley on top of my cake plates for now. 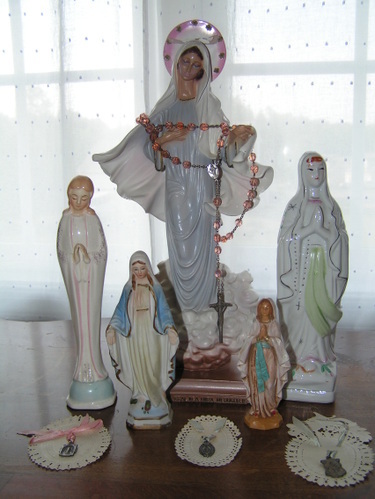 Below are some old buttons, keys and mother of pearl buckles to incorporate in artwork. The silk bag is a lingerie bag. And that's just a scrap of ruffled old lace. Love it. 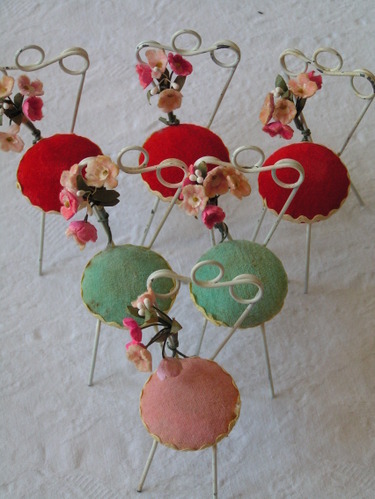 And THEN, I turned a corner and a dusty box full of these little dollhouse chairs spilled out at my feet. I couldn't believe my luck! Only $2.25 a piece. 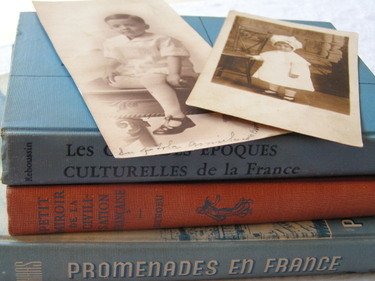 And finally some old French books and a couple of cabinet cards of children. I also got a couple of flower covered hats, but I already took the flowers off and dumped them in my basket of millinery stash. For all of you who ordered wallpaper parcels, they are going in the mail tomorrow. 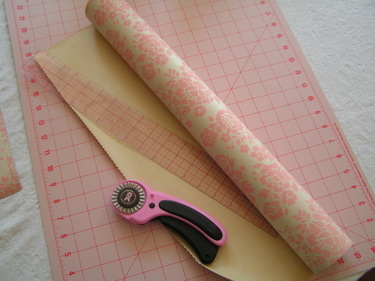 All I can say is God Bless the person who invented the rotary cutter. I could never have cut all this paper with scissors! 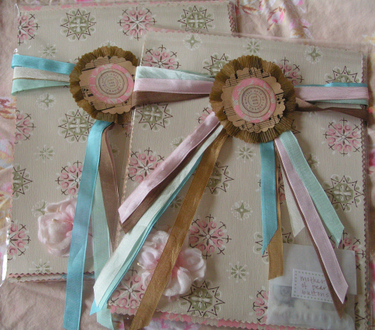 Here are the wallpaper parcels I sent out to Martha and Karla, the lucky winners of my birthday drawing. They should be arriving anyday girls! Many of you asked if I would be selling these........well, why not?! The quantities are limited. 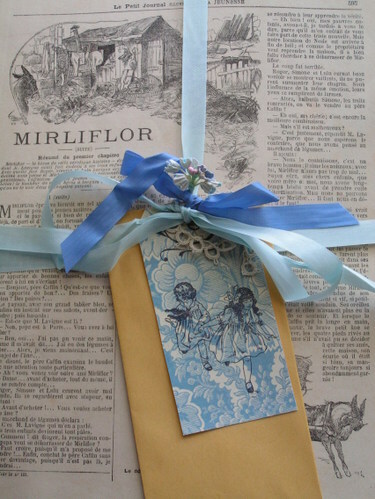 I have made up only 10 parcels for sale. It's on a first-com first-serve basis. If you're interested in purchasing one, just leave a comment with your email address. I'm so sorry, but I can only ship to the first ten who leave a comment. I wish I had an endless supply of wallpaper for all of you! I will invoice you via Paypal. If you do not use Paypal, I'll accept a personal check or a money order also. Each Parcel will include: 10 different 8.5 x 11" sheets of vintage wallpaper, 2 sheets of vintage ledger paper, 2 sheets of vintage sheet music and a few extra little surprises for you! All goods are vintage. Thank you all for your orders! I will email you today to get your mailing addresses. Hi Girls! Happy Friday to everyone! 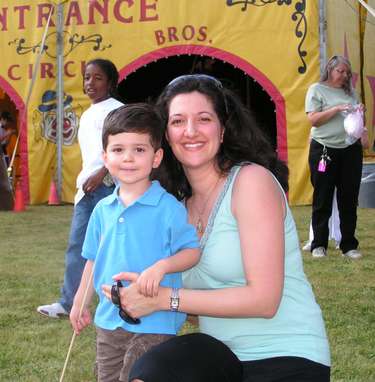 Last night we took Mario to his first circus under the Big Top! 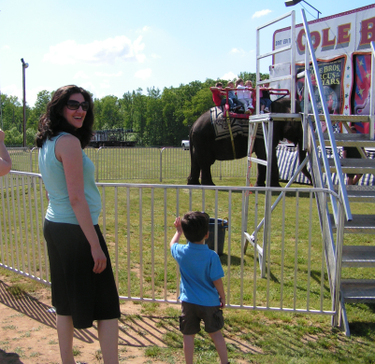 It was actually George's first circus too. Lots and lots of fun. 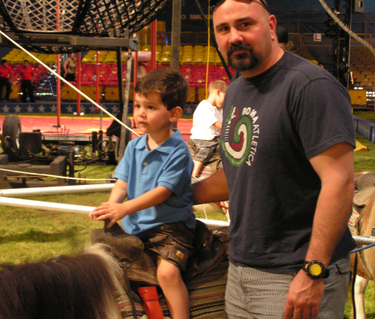 I think his favorite part was the pony ride before the circus began. 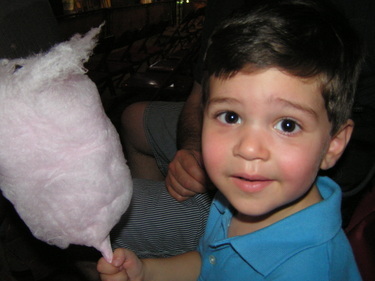 Oh, and the cotton candy was a close second! This baby elephant was so gentle. All the kids sat up top and went for a ride. Here's Mario and me enjoying the scene. I pretty much live in gauchos these days. Maternity clothes are too big but anything else is too tight. Love my gauchos. Mario was smiling the whole time....until I got the camera out of course. How could you NOT love a circus? !